In 2008, Mathieu Flamini was arguably one of the best central midfielders in the Premiership and a key member of an Arsenal side that should have won the title that season. Two years previously, he had demonstrated his versatility by filling in at left-back in a Champions League campaign that took Arsenal to the final. Yet just this summer, Flamini became a free agent and was forced to take a significant wage cut to re-join AC Milan. His is a cautionary tale that the grass isn’t always greener. 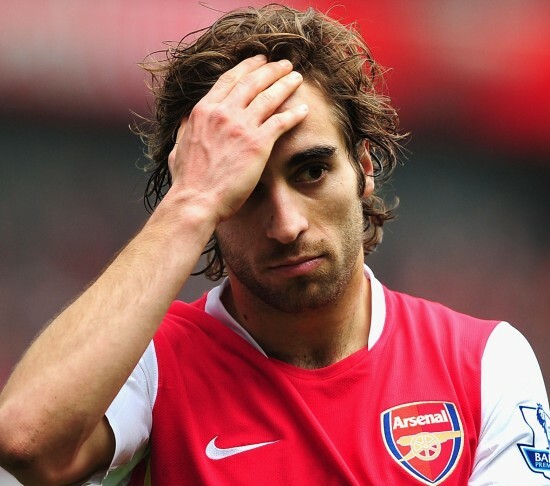 Of course, Flamini was never meant to be a first choice player at Arsenal. When opportunities arose though, he seized them and his dogged, tireless dedication to the cause quickly saw the Frenchman become a fan favourite. A genuine injury crisis in defence during the 2005-6 season, that also saw Philippe Senderos thrust into the limelight and perform admirably, allowed Flamini his first decent run in the side. A superb slide-tackler capable of playing the inch-perfect pass, Flamini’s best asset was probably his stamina. When Arsenal weren’t in possession he could chase down, harry and if necessary tackle until they were on the ball again. He was so tough too. If he was fouled, he’d pick himself up again and shrug it off. While he could smarten up nicely, he also revelled in his scruffy southern French look – he was born and raised in Marseilles and went through their academy. Flamini was cool in a distinctly Gaelic way. With Arsenal reasonably well stocked in midfield, Flamini was unhappy with the ‘utility man’ tag he had acquired. Consequently, he was actually very close to leaving the club in 2007 and turned down a move to Birmingham City that summer. Arsenal had a good relationship with Birmingham in those days; players such as Nicklas Bendtner, Sebastian Larsson, Fabrice Muamba and Jermaine Pennant all spent time there, either on loan or on a permanent transfer. It took the influence of his fellow countryman Arsene Wenger to convince Flamini to stay another year. And it was this 2007/8 season in which he played his best football. Forming a dynamic central-midfield partnership with Cesc Fabregas, the Gunners got off to a flyer and were unbeaten in the League in their first 15 games. September was particularly impressive; Wenger and Fabregas picked up the monthly awards, while Arsenal had a 100% record. Flamini was a focal point for the team and played a crucial role in mopping up. This allowed to Fabregas to roam further up the pitch in a more advanced position. Emmanuel Adebayor was also at the peak of his powers too, scoring 30 goals in all competitions that year. Even Flamini found the net three times in the League, including this absolute stunner against Newcastle in January. A ball had never been hit so sweetly. Yet, as has become characteristic of recent Arsenal sides, capitulation came on the home straight. A week after a 4-0 FA Cup defeat to Manchester United at Old Trafford, Arsenal went to Birmingham City, five points clear and with 12 games to go. The atmosphere wasn’t quite right before the game. A number of the players had been hit particularly hard by the death of Bacary Sagna’s brother Omar and wore black armbands in his memory. Everyone knows what happened that day at St. Andrews. It was nothing new to suggest that the only way to stop Arsenal was to kick them. Martin Taylor, a mediocre player with a mediocre career, committed a horror challenge on Eduardo da Silva in the third minute and in that moment, Arsenal’s title aspirations were crushed. They drew at Birmingham and three more draws followed. Defeats against Chelsea and United put an end to any hopes of reigniting their challenge. As for Flamini, there was a touch of irony that his season came to an end in a far more innocuous instance. Running for the ball alongside Steven Gerrard in the Champions League tie against Liverpool, Flamini suddenly pulled up and it emerged later he had done his ankle. Had he remained fit, Arsenal just might have been able to hold it together that year to win something, or at least qualify for the Semi Final of the Champions League. His injury was just part of a series of highly unfortunate events. It proved to be Flamini’s last game for the club. His contract expired that summer and with Arsenal refusing his wage demands, he signed a lucrative contract with AC Milan. Flamini had ties with Italy as his father Roland is Italian. However, he was quickly hit with a double dose of bad news. Milan did not qualify for the Champions League, something of a given for any Arsenal player. Furthermore, he was left out of France’s Euro 2008 squad at the expense of former-Arsenal player Lassana Diarra. So what were the long-term ramifications for Arsenal and that defensive midfield position that Flamini had occupied so well that season? Gilberto Silva, a lynchpin in Arsenal’s Invincibles Season of 2003/4, had been left out in the cold by the club. Flamini had usurped him in the starting XI and understandably, the Brazilian wanted out too. With Gilberto, Flamini and Diarra now all gone, Arsenal were suddenly severely lacking in defensive or holding players. Wenger made some attempts to convert the skilful attacking midfielder Denilson into something more holding, a la Gilberto. This started off reasonably well and many are quick to forget Denilson’s spells of promise at the club. However, in learning this new role, he seemed to lose the ability to keep possession. Thus, it fell upon Alex Song to establish himself in front of the back four. He rose to this challenge superbly, becoming a key player in the Arsenal side between 2009 and 2012. However, last season, Song discovered more creativity going forward. His trademark chipped through ball, as well as his bursts of dribbling, proved excellent foils to the extraordinary finishing of Robin van Persie. Meanwhile, Flamini has struggled at Milan. He found himself being used as a utility player again, the reason he had cited for wanting to leave Arsenal in the first place. A high point did come in 2009/10, when Milan won Serie A, with Flamini playing an important part in the side. However, he has since been ravaged by injury to the point this summer where his contract expired and he was forced to take a wage cut. A dynamic player with great tenacity, it is such a shame that Flamini did not see his future at Arsenal. Fabregas stayed at the club for three more seasons and there is no knowing what they would have been capable of. The pair were of a similar age and were maturing together. He also might have built upon an International career that had briefly got off the ground while he was at Arsenal. Au revoir, mon frère. This entry was posted in Player profiles and tagged 2007/8, ac milan, alex song, arsenal, arsene wenger, bacary sagna, birmingham city, cesc fabregas, champions league, eduardo da silva, emmanuel adebayor, england, fa cup, false nine, france, italy, martin taylor, Mathieu Flamini, omar sagna, premier league, premiership, robin van persie by Hugo Greenhalgh. Bookmark the permalink. and a great player… Au revoir indeed! !